Always Be Closing. The salesman’s mantra must be followed by four men in a failing office. So a competition is run. First prize is a Cadillac, Second prize is a set of steak knives. Third and fourth are you’re fired. With a week to make good or be fired Roma (Al Pacino), Levene (Jack Lemmon), Moss (Ed Harris) and Aaronow (Alan Arkin) hit every desperate measure they can think of to make the sales, hopefully with the help of Williamson (Kevin Spacey), the office manager. As time moves on some superb leads are available, the Glengarry leads, but Williamson is only allowed to give them to the top performers. The pressure continues to mount and risks must be made. Mamet’s play translates brilliantly into this studied and difficult movie. The faint of heart will feel for the salesmen’s dilemma and the hard of heart will relish the patter and knowing of the procedures inherent in, well, sales. Sometimes hard to watch, there is no doubt that this movie contains some of the finest acting talent available and they pull out all the stops for the wonderful script. 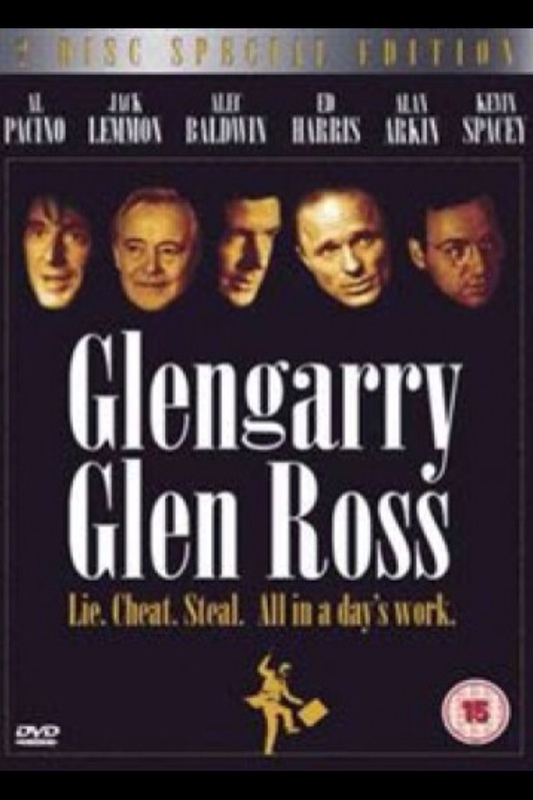 How Glengarry Glen Ross was only nominated for one Academy Award is beyond me, losing out big time to Howard’s End and Unforgiven.